Published March 10, 2016 By Leisa Good This post may contain affiliate links. Regardless, I only recommend sites I've researched and/or used and trust. Are you looking for a very different kind of work-at-home job? Are you passionate about sharing your knowledge and experience with others? Are you ready to create great travel experiences as a virtual tour guide? If so, Vayable may be the opportunity you have been searching for. Vayable is an online company where “insiders” create online guided tours for extra money. Most of the people that sign up with Vayable are the ones with an active online presence or who are the ones well-known throughout their town or city for a particular talent or expertise. These individuals are what Vayable refers to as Insiders, which is basically their word for virtual tour guide. Featured in The New York Times, CNN, The Wall Street Journal, CBS News, and Fast Company Magazine—Vayable continues to create new and different perspectives of some of the best known cities in the world. This perspective or experience can be captured via a Smartphone video and show not only the landmarks of the city, but also its culture. Videos of street art, restaurant tours, live festivals, and folk dancing are some of the many ways that Vayable Insiders create unique experiences for travel lovers. Even writers, poets, painters, historians, travel agents, avid kayakers, and taxi drivers are able to chime in with their own personal or professional perspective of a tourist spot. Vayable believes in “outside-the-box” tourist experiences and will even book the entire trip for the tourist. And of course, you can share your video with these tourists anytime during their trip or soon-to-be trip. Vayable will also be working with you, the virtual tour guide, to help curate and arrange the travel and activities for the tourists. Your role will almost be that of a virtual tour guide/travel consultant at that point as you may be asked about restaurants or other area attractions. What Else Do Virtual Tour Guides Do? make a commitment to delivering high-quality experiences to every traveler. be passionate, personable, and trustworthy. In other words, you as a virtual tour guide would never want to be “so adventurous” that you recommend something like a swim, dive or jump that could be potentially dangerous to a tourist. Once you sign up and agree to the terms and conditions, you will be able to create a profile for yourself. Many of their guided tours are featured in blogs and press, so this would be a good way to gain notoriety. a way to accept credit cards. a way to create and maintain your own schedule. a toolbox of marketing materials to grow your Vayable business. a community of other Vayable Insiders. a blog for learning and sharing. a dashboard to manage your Vayable reservations. free marketing done by Vayable. What Are the Special Requirements and Computer Requirements to Sign Up at Vayable? There really are no special requirements other than to be passionate and knowledgeable about how you wish to present your tour. You can be a seasoned expert or a savvy local ready to introduce your location. To be accepted into the Vayable Insider community, you will need to have your identity and email verified as well as do a video interview to keep the community safe. As far as computer requirements, there aren't any. Just an updated laptop or PC with anti-malware and anti-virus installed. Then of course, you'll need a Smartphone or iPhone to snap pictures or do your video recordings. Most of what you will do can be done with your just your phone. How Much Money Can You Make as a Virtual Tour Guide at Vayable? That will really depend upon you and your ratings. You do have the flexibility to set your own prices, and there are guidelines to help you determine your rate. 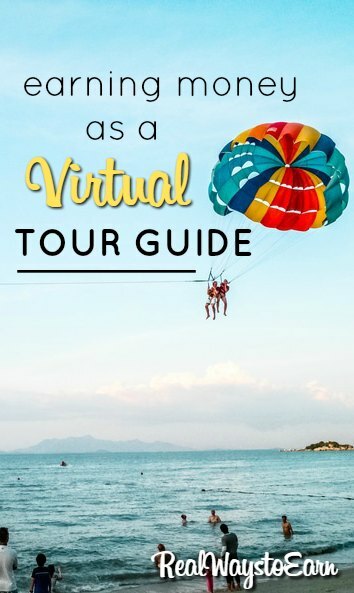 Later on, you may also want to consider becoming a virtual ambassador and assist more with the offline tour instead of just the virtual tour. What Do Others Say About Their Experiences as a Virtual Tour Guide at Vayable? I couldn't find any reviews on the tour guide position itself, but I did find two tourists on Yelp posting their experiences about a tour of San Francisco. You can read it for yourself. How Could an Interested Individual Sign Up at Vayable? It might not be a bad idea to go ahead and read the FAQ section under Support. This will give you a better idea of whether or not this would be a good fit for you. If you are still convinced you want to give this a try, then click the Become an Insider button at the bottom of the Guide page. P.S. – Are you looking for other work at home jobs in the travel and hospitality industry? If so, you can try FlexJobs. They post these types of leads almost daily, and they are guaranteed scam-free. It is about $15 a month, and you can set your account up so you're only billed once if you just want to check it out to see if you think a membership is worth it. @Cori Ramos – thank you so much for sharing and passing this along. Yes, it does sound like fun. Not sure I want to film any parachute jumps though.